Wolfsburg / Tokyo, November 2013. 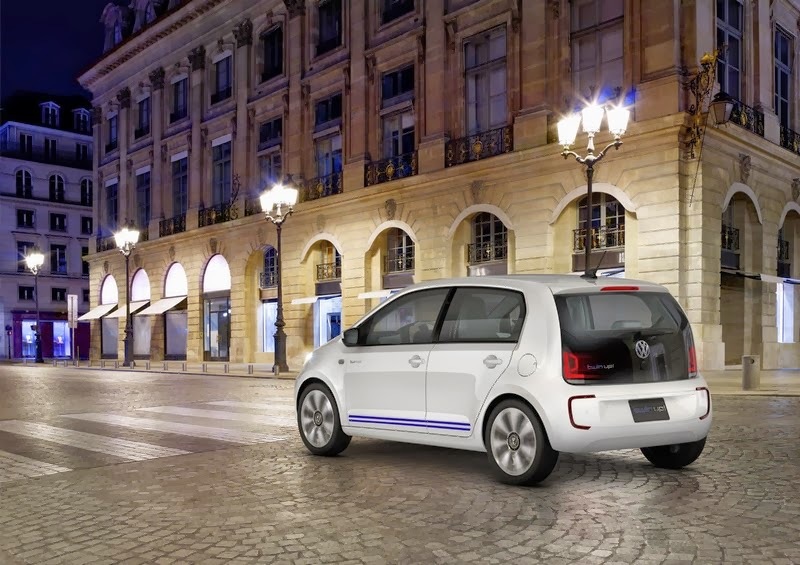 This year, Volkswagen introduced the world’s most fuel-efficient production car to the streets in the form of the XL1 – a plug-in diesel hybrid for two people. It consumes just 0.9 l/100 km. The monocoque and add-on parts of the XL1 are made of carbon fibre reinforced polymer. This innovative, cutting-edge vehicle by Volkswagen is currently being manufactured in a limited production run. Now, Europe’s largest carmaker is applying experience gained from making that technological showpiece and is transferring this concept in a research phase to high volume production. 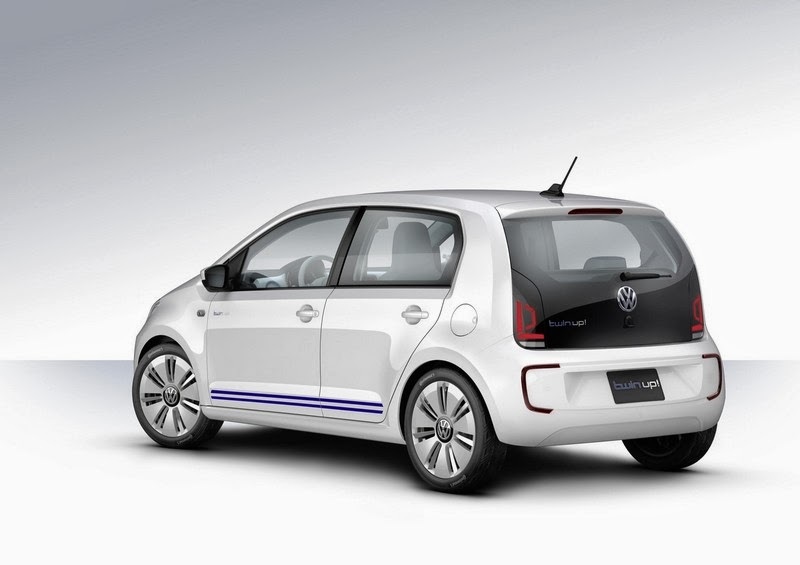 Volkswagen is presenting this new car in a world premiere at the Tokyo Motor Show: the twin up! concept car – a plug-in hybrid version of the successful city specialist, the up!. The four-seater shares certain parts of its drive system with the XL1 – including its diesel engine, electric motor and dual clutch gearbox (DSG). Compact hybrid system. 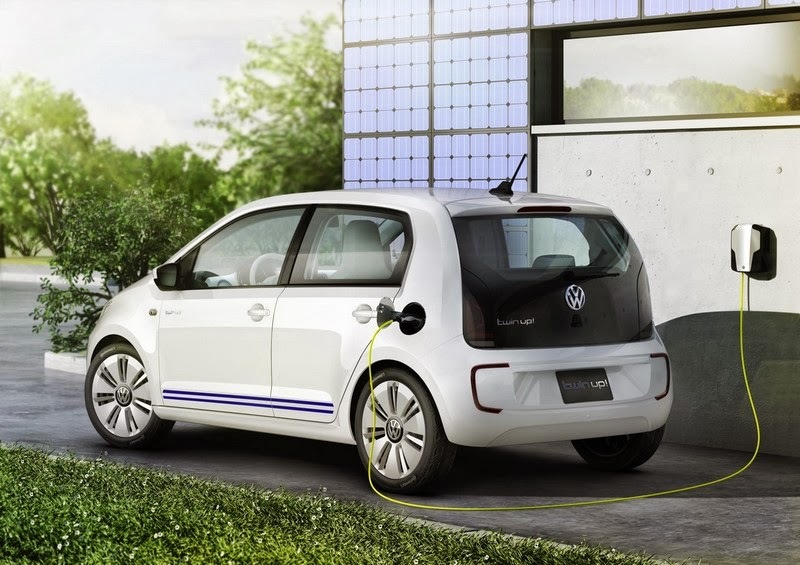 Since all new Volkswagen vehicles are configured to accept alternative drive systems as well as conventional ones, it was easy to install the compact plug-in hybrid system in the twin up!. The only modification made in the production version was to lengthen the extremely short front overhang by 30 mm. The drive unit of the twin up! (system power: 55 kW) is mounted at the front of the car. 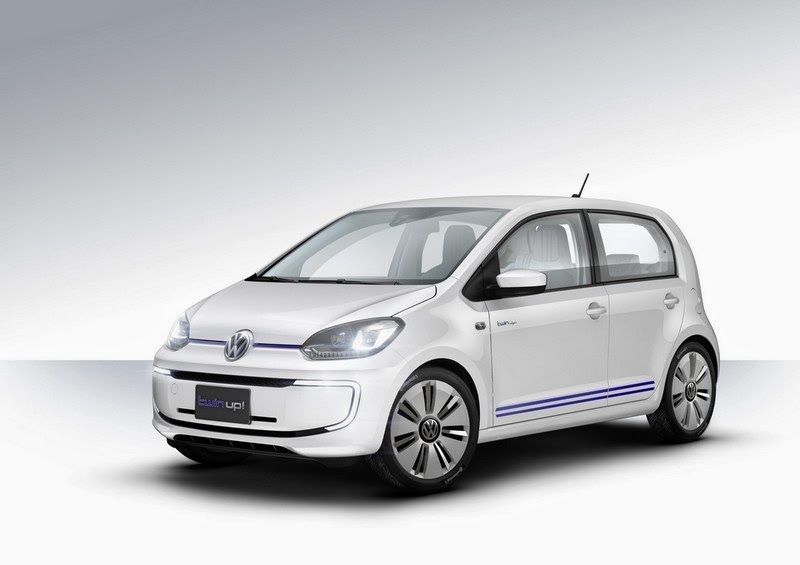 It consists of a 0.8 TDI (35 kW), an electric motor (35 kW), a 7-speed DSG (“DQ200E”) and the power electronics. Installed at the back, behind the rear seats and the boot, is the “fuel storage system”: a lithium-ion battery (energy capacity: 8.6 kWh), the 12V battery for the electrical system and a 33-litre fuel tank. Maximum efficiency. The car attains impressive efficiency values based on a successful combination of good aerodynamic properties (cD x A = 0.30 x 2.08 m2), a low unladen weight, (1,205 kg) despite the addition of a battery system, lightweight plug-in drive components and tyres (165/65 R 15) optimised for low rolling resistance. In all-electric mode with its zero emissions, for example, the twin up! has a driving range of 50 km. In the “New European Driving Cycle” – the standard testing and comparison driving cycle for plug-in hybrid vehicles in Europe – the concept car returns a sensationally low fuel consumption figure of 1.1 l/100 km, which equates to CO2 emissions of just 27 g/km. Good driving performance. The plug-in hybrid concept car highlights the fact that efficiency and driving fun will not be mutually exclusive in the future. Consider the electric drive: in zero-emissions mode, the twin up! accelerates to 60 km/h in just 8.8 seconds, and if necessary it can move through the world’s large cities with a style of driving that is as swift as it is quiet. When exclusively powered by the electric motor, the concept car’s top speed is 125 km/h. Driving is equally fun in hybrid mode, because in this mode the drive system delivers 215 Nm of torque, a high value for a small car. Outside the city, the twin up! can accelerate to 100 km/h in 15.7 seconds in this mode with a top speed of 140 km/h. Two-cylinder TDI. 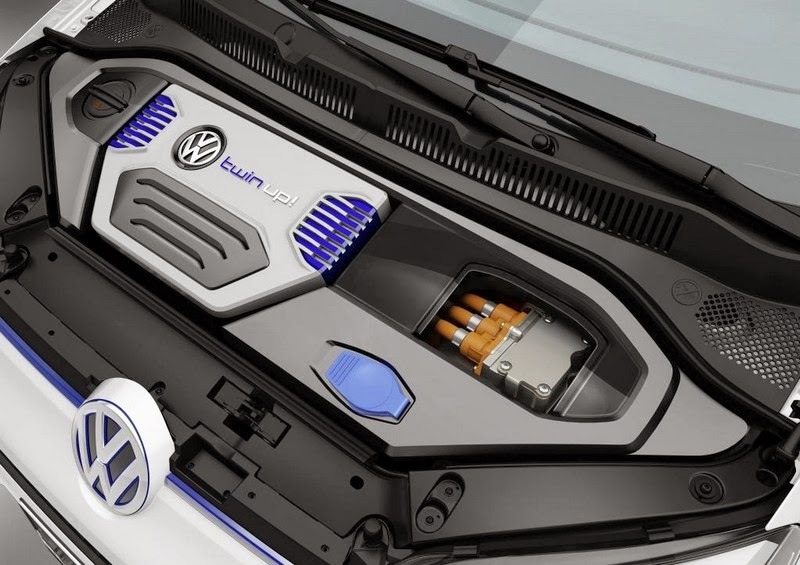 The TDI produces its mentioned peak power of 35 kW from just 0.8 litres of displacement. The two-cylinder TDI was derived from a common rail four-cylinder (1.6-litre displacement). The 0.8-litre TDI has a cylinder spacing of 88 mm; its bore is 81.0 mm, and its stroke is 80.5 mm. Besides reduced engine displacement, other emissions-reducing measures were implemented such as specially formed piston recesses, multipoint fuel injection and controlled orientation of individual injection sprays. Smooth running of the small engine is ensured thanks to a balancer shaft. An exhaust gas recirculation system, oxidation catalytic converter and diesel particulate filter are used to reduce emissions values. Hybrid module. Located between the TDI and the 7-speed DSG is the hybrid module with an electric motor and decoupling clutch; this module was integrated in the DSG housing in place of the usual flywheel. 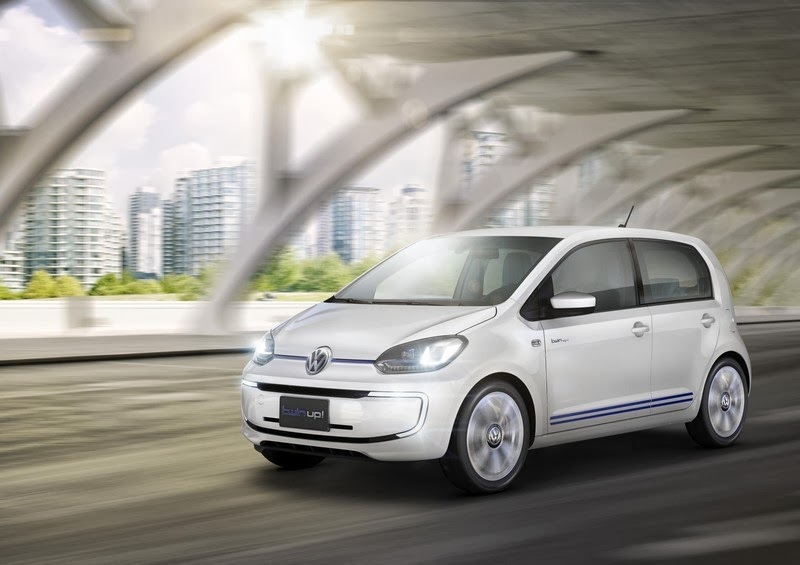 The electric motor is supplied with energy from the external lithium-ion battery that can be charged by the TDI (energy capacity: 8.6 kWh). The power electronics, which operate at a voltage of 308 Volt, manage the bidirectional flow of high-voltage energy between the battery and the electric motor and convert direct current to alternating current. Order under the bonnet. The engine compartment of the twin up! is completely covered. All service access points are in maintenance-friendly locations. A matt black engine compartment cover with acoustic insulating effect organises all recognisable components, providing for better organisation. The power electronics, and the service access located across from it, are integrated in a high-gloss black band, which also functionally partitions the engine compartment. A central acoustic capsule in aluminum look – as part of the engine compartment cover – unites design themes from the world of combustion engines and electric motors, where the electric elements are coded in the colour blue. Interplay of drive modes. As previously noted, the electric motor by itself can power the twin up! for distances of up to 50 km and to a top speed of 125 km/h. In electric mode, the TDI is decoupled from the drivetrain by opening the decoupling clutch and is shut off. Meanwhile, the driving clutch on the gearbox side remains closed, and the 7-speed DSG is fully engaged. Provided that the battery has a sufficiently high state of charge, the driver can choose when and where the twin up! should be driven all-electrically by simply pressing the e-mode button. Later, the process of restarting the two-cylinder engine is a very smooth process. When a “pulse start” of the TDI is performed while driving, the rotor of the electric motor is revved, and the engine-side clutch is engaged very quickly. This turns the TDI, accelerating it to the necessary engine speed, and starts it. The entire process runs without jolts, and for all practical purposes the driver does not even notice the TDI restarting. Energy and drive management. When the twin up! is braked, the electric motor operates as a generator; its braking energy is used to charge the battery (regeneration). Load point shifting of the TDI, which can be performed under certain operating conditions, has a positive effect on engine fuel efficiency, including energy usage in the hybrid system. Load point shifting makes the turbodiesel operate at more favourable efficiency levels, and excess energy can be fed to the battery. Another method for improving fuel efficiency is in gear selection of the automatic 7-speed DSG. The engine controller regulates the entire energy and drive management system based on the specific load demanded by the driver. Parameters flowing into this control system include the accelerator or e-pedal position, engine load, energy supply and mix of kinetic and electric energy, so that the system always uses the optimal type of propulsive power. Exclusive body paint and bright interior. Volkswagen is presenting the concept car in Tokyo in the exclusive effects paint “Sparkling White”, which creates a changing pattern due to the blue “glass flakes” that are mixed in. Depending on the angle of incident light, this changing pattern can be especially intensive at body edges. The bright and friendly interior is dominated by the colour “Ceramic”; colour coordinated is the sporty leather-fabric combination of the customised seats with reflective strips on their centre panels. 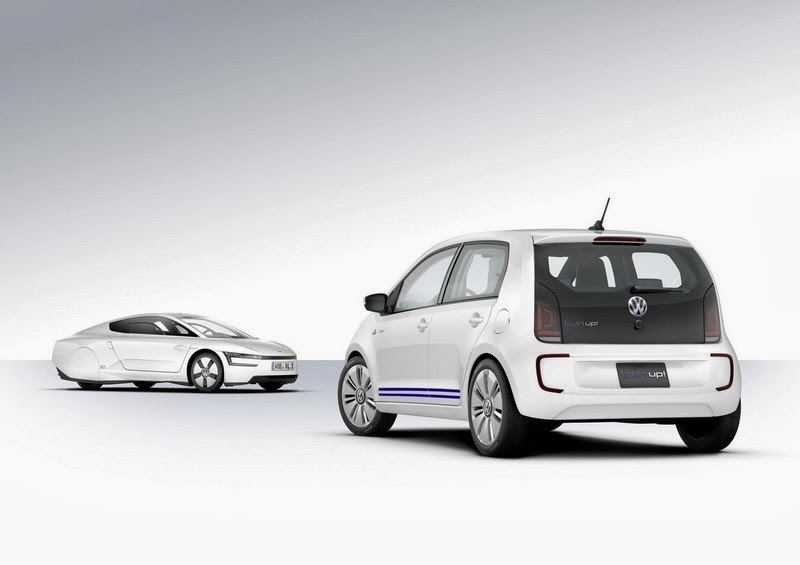 Two “corporate blue hues” used for the Volkswagen themes of “e-mobility” and “Think Blue.” form the colour basis for numerous design details. Some examples: blue lines frame the seats as double piping, which emphasises the ergonomic contour of the seats all the way into the integrated head restraints. In the bright multifunction steering wheel and in the trim for the gear shift lever, the interplay of the two blue hues accentuates the interior in the form of decorative stitching. On the outside, the motif of flowing blue double stripes is repeated above the sill area. Digital instrumentation. Controls and display components were redesigned for the twin up!, and user control, status display and climate control functions on the concept car were implemented entirely in digital form. It creates a uniform formal unit and a futuristic ambience with the very precise and prominent graphics of control and display components in blue and white hues. Intuitively accessible information. The instrument cluster of the twin up! was designed to the goal of combining the image of a precise measuring instrument with a unique form of digital aesthetics. The representation of interactions is fascinating with its flowing transitions and informative animations, which focuses on the information needed and noticeably improves intuitive understanding. The visual image and information contents of the instrument cluster change according to the operating mode – (hybrid or all-electric). One of the changes made when switching modes is that the needles, scaling and ambience lighting that frames the instrument cluster changes from white (hybrid mode) to blue (all-electric mode). The digital information is communicated with fascinating dynamics and high precision. User-configurable home screen. Individual menus can be called up in the central infotainment system, and they are selected by seamless keys on the side display area or directly by touchscreen. The home screen of the infotainment system can be customised; that is, users can individually define menu items such as “Contacts”, “Sideway app” (other user-configurable categories for points of interest along the route), “Energy efficiency”, “Weather”, “Air quality” or “Climate control”. Digital climate controls. In the twin up!, climate functions are shown exclusively in digital form – for the first time in a Volkswagen. This innovative concept follows a completely new approach to visualisation, which systematically exploits the marvellous capabilities of super-brilliant and high-resolution “AMOLED” (Active Matrix Organic LED) displays. All climate control functions are adjusted via the central touchscreen. Here, a “body-oriented” operating logic is used, which is able to adjust settings for an individually “perceived temperature” for the driver or passenger – not just the air flow as was previously the case – but for different body zones. The automatic climate control then automatically makes the required temperature and blower adjustments and handles air distribution.